Glioblastoma multiforme, the most common of malignant brain tumors in adults, is one of the deadliest of all forms of cancer. Striking some 18,000 new victims in the United States every year, the disease is always fatal, usually within six months of onset. Surgery and conventional radiation therapies may prolong life for up to a year, but cannot stop the tumors from continuing to spread throughout the brain. There are anticancer drugs that show promise against glioblastoma multiforme tumors, but getting these drugs past the blood-brain barrier has proven to be a major challenge. There is, however, new reason for hope. A collaboration of researchers from the Lawrence Berkeley National Laboratory and the Children's Hospital of Oakland Research Institute (CHORI) have demonstrated, through in vitro studies, the potential for nanosized synthetic particles of low density lipoprotein, or LDL, to be used as a safe and effective means of delivering anticancer drugs to glioblastoma multiforme tumors. 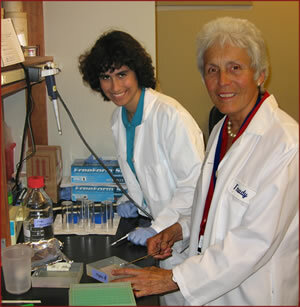 Trudy Forte (right) and Mina Nikanjam led the study showing that nanosize particles of synthetic low density lipoprotein selectively bind to tumor cells of glioblastoma multiforme, a deadly form of brain cancer. "We have now identified LDL receptors on glioblastoma multiforme tumor cells that can serve as specific molecular targets," says Trudy Forte, a specialist in lipoprotein research with joint appointments in Berkeley Lab's Life Sciences Division and CHORI. "Because these LDL receptors are sparse in normal human brain tissue but elevated on the tumor cells, our synthetic nano-LDLs can deliver drugs to the glioblastoma multiforme tumors while sparing healthy cells." Forte, who led the study, and her colleagues Mina Nikanjam, Eleanor Blakely, Kathleen Bjornstad, Xiao Shu, and Thomas Budinger, reported the results of their work in a recent issue of the International Journal of Pharmaceutics. Glioblastoma multiforme is a cancer of the glial cells; it's also known as "octopus tumors" because of the manner in which tendrils of malignant cells can extend into surrounding healthy brain tissue. Glial cells provide physical and chemical support for neurons and make up about 90 percent of all the cells in the brain. As the term "multiforme" suggests, malignant cells can take on a wide variety of different shapes, making detection difficult until the tumors become quite large. The multiple forms assumed by the malignant cells also make it difficult to identify and locate all of the tendrils. If removal or destruction of the main glioblastoma multiforme tumor mass leaves tendrils intact, therapy is ineffective: like the mythical Hydra, the tendrils will sprout new tumors. A supplement to surgery is needed that will eliminate all of the cancer cells. One solution would be to follow surgery with anticancer drugs. However, drugs are infused into the blood, which presents a problem because of the blood-brain barrier, a tightly knit membrane of capillary endothelial cells at the boundary between the central nervous system and the rest of the body that protects the brain from infection and from harmful substances in the blood stream. By controlling what passes into the brain on the basis of size and chemistry, the blood-brain barrier can block the introduction of anticancer drugs. Researchers have been looking for a means of circumventing the blood-brain barrier. A few years ago Forte and coauthor Blakely were part of a team who were characterizing a tumor-seeking compound known as "boronated (proto)-porphyrin," or BOPP, which was known to concentrate in glioblastoma multiforme tumors. Using the specialized equipment at Berkeley Lab's Life Sciences Microscope Resource, they identified the chemical sites where BOPP binds to glioblastoma multiforme tumors. These binding sites turned out to have the same receptors that are used to take in low density lipoproteins. "Tumor cells generally have high cholesterol requirements as they are rapidly dividing, and LDLs are the major transporters of cholesterol in the plasma," explained Forte. "Increased LDL receptor activity has been observed in other forms of cancer besides glioblastoma multiforme." Using seven lines of human glioblastoma multiforme cells, Forte and Blakeley and their collaborators found them to harbor anywhere from 125,000 to 950,000 LDL receptors (LDLRs) per cell. Given that previous studies on monkeys and rats indicate that normal brain tissue, particularly neurons, harbor few LDLRs, these receptors became an inviting target for drug delivery. Natural LDLs are variable in size and composition, however, and difficult to isolate in large quantities, which makes them less than ideal as a drug delivery system. So Forte and Nikanjamundertook to develop synthetic, nano-sized LDL particles (nLDLs), much smaller in size than natural LDLs and easier to work with, which would target the low density lipoprotein receptors on glioblastoma multiforme cells. They accomplished this by synthesizing a peptide that features two functional regions, one which binds to LDLRs and one which binds to the fatty, water-insoluble molecules known as lipids. This synthetic bifunctional peptide was combined with a lipid emulsion to produce particles that measured about 10 nanometers in diameter. Natural LDLs typically range from 20 to 25 nanometers in diameter. "Using a fluorescent dye as a model drug, we were able to confirm that in cell cultures the synthetic nLDLs efficiently bind to the surface of glioblastoma multiforme cells," said Forte. "When we treat the glioblastoma multiforme cells with suramin, an inhibitor of LDL interaction with LDLR, the binding of the nLDLs stops, an indication that the LDL receptor is a molecular target for the nLDL." The experiments that showed how effectively the synthetic nLDLs bound to the LDLRs were largely carried out by Mina Nikanjam, who in addition to being a guest researcher at Berkeley Lab and a member of Forte's research group at CHORI, is also a doctoral student in the University of California at Berkeley's Department of Bioengineering. "The biggest surprise about our experiments for me was, overall, how smoothly they went," Nikanjam said. "While there were tests that had to be revised and redone, we didn't have to make any major changes. We settled on the method of creating our synthetic nLDLs very quickly and stuck with it throughout." The idea behind the synthetic nLDLs serving as anticancer drug delivery vehicles is that, once the nLDLs have bound to the LDLRs in a glioblastoma multiforme cell, the particles will be taken into the cell by endosomes, which are membrane-bound compartments inside cells. There, the LDLRs will be dissociated from the nLDLs and recycled back to the cell surface, while the nLDLs will be shuttled into the lysosome for digestion  along with their anticancer drug charge. Confocal microscopy indicates that fluorescently labeled nLDL particles are taken into the cell by LDL receptors and are found together in the cell's lysosomes, sac-like organelles which contain enzymes that can break down and destroy cellular components. Images on the left show peptides (green) and lipids (red), components of the nano-LDLs. When these images are merged (third from left), the yellow/orange color indicates that the peptides and lipids are in the same places in the cell. The final image (right) reveals that the sites where the nLDL peptides and lipids are localized are in the lysosomes, here outlined in blue. Even at 10 nanometers the synthetic nLDLs are still too large to cross the blood-brain barrier, Forte and her colleagues note. This means that nLDLs cannot be delivered systemically by infusion into the blood. The nanoparticles could be carried to the cancerous cells via a technique called "convection-enhanced delivery," however. In this technique, one or more catheters are implanted into the brain and pressure is used to infuse particles into a target area. "The catheters can be put into place after the surgical removal of the main glioblastoma multiforme tumor mass," said Forte. "We could then use convection-enhanced delivery to send in the nLDLs with their charge of anticancer drug and destroy any remaining cell islets." The next step will be to test the ability of the synthetic nLDLs to carry a sufficiently large drug payload to kill glioblastoma multiforme cells in culture. With chemical modifications, the synthetic nLDLs should be able to transport lipophilic ("lipid loving") anticancer drugs. Preliminary studies are very promising, revealing that a derivation of a form of the cancer drug taxol can be transported into cultured glioblastoma multiforme cells by nLDL and is capable of killing the cells. If all goes well with the second round of tests, in vivostudies with rats could commence in about a year. Although Forte and her colleagues are focusing on glioblastoma multiforme, their nLDLs should also be applicable as drug delivery vehicles for other forms of cancer with elevated numbers of LDLRs. This work was supported in part by CHORI Institutional Funds and the U.S. Department of Energy. "Synthetic nano-low density lipoprotein as targeted drug delivery vehicle for glioblastoma multiforme," by Mina Nikanjam, Eleanor A. Blakely, Kathleen A. Bjornstad, Xiao Shuc, Thomas F. Budinger, and Trudy M. Forte, appears online in the International Journal of Pharmaceutics.